Only two writers have been able to achieve such a horror in my adult life that I have had such terrible nightmares in the middle of the night that I have woken up in a cold sweat willing to take the risk of keeping my eyes open until the comfort of the morning sun relieves me from the horror that is somehow wrapped around my brain because of their prose. Obviously, the number one person on this list will be one of those writers, but the other one is one of the best satirical voices of this era, Chuck Palahnuik. Haunted is the story that he wrote that gave me these tremors. Now, I will place the disclosure before I continue on with my discourse about his brilliance that what he wrote is not for the feint of heart, and if you are young, there is no way that you should ever consider reading this book. 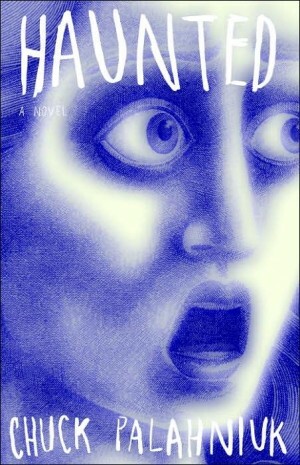 Keep in mind, I am an adult who enjoys exploring the dark side of the soul, and this book gave me nightmares. Just imagine what it will do to an individual who is not ready for these ideas. If you are still curious I would suggest you read “The Nightmare Box” first before you explore the rest of the book. It is in the middle of the book, and it is okay to read that first because the book is actually a frame story, much like a haunted version of The Canterbury Tales. Palahniuk wrote a series of stories that are tied together with one common idea in this book, and some of them are so dark and disturbing that you will start to wonder if they are really about you. “The Nightmare Box” gives you a glimpse of what will happen to you if you believe you are strong enough to look into all of these stories. They are not your typical horror tales of monsters lurking under the bed. Instead, they are the monsters haunting us from the inside. If you believe that you are strong enough to take that peek into the Nightmare Box, then start back at the beginning, but understand that what you see there you can not take back. Reader beware, this is one of the most horrifying experiences of your life.